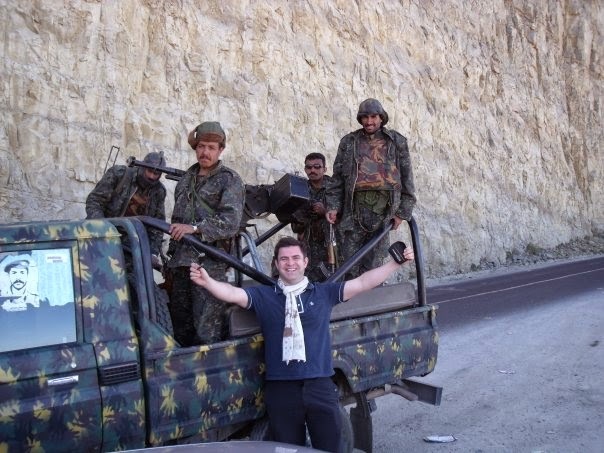 * A Few Years Ago......I went to Yemen by mistake. It may sound strange, but at the time I was writing travel pieces (still do, available for hire, cross my palm with silver). But being a freelancer, I was at the bottom of the pile when it came to press trips. There were three kind of travel junkets in newspapers. The first, were the ones you never heard about. You would just realise that somebody got a free fortnight in the Bahamas or Australia when the news-editor turned up after a being off with a deep tan. In January. The second, the week in Spain or Italy, went to the staffers. The third, the Weird Ones, went to us freelancers. And so it was that I ended up going to Yemen. A place that is now in the news thanks to tragic events. The Iranians and the Saudis have joined in an already volatile situation - bombing and killing in a bid to find out which version of Early Medieval mysticism is the correct one. And every time I hear about the conflict there, my heart sinks a little - because going to Yemen was an amazing if accidental experience. I took the trip on a last-minute, "Yeah, Sure why not?". It was the weirdest place I have ever been too (and I talk as somebody who once bounced around the highlands of Uganda and Rwanda for ten days. AND trekked thru deepest Leitrim). But it was ....stunning, other-worldly. In parts, it was as if we stepped out of our Toyota Jeep and straight into the 13th century. 'You're going WHERE?" It was the standard and understandable response when I told people I was about to go to Yemen for some sight-seeing. There are places where we go on holiday (Spain, France, Italy), places we go travelling (Peru, Vietnam and Tibet) and places which, for even the most committed global wanderers, are fated to remain forever off the map. Yemen was definitely one of those places for me. The only thing I knew about it was that it was somewhere near Somalia (in the news then because of recent piracy in the Arabian sea) and Chandler from Friends once had to go there in a bid to escape from his annoyingly-voiced girlfriend, Janice. Also! 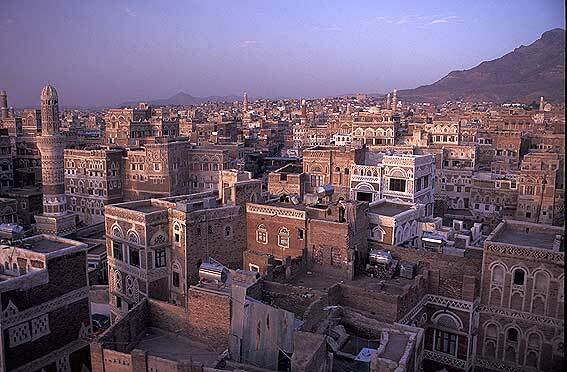 Bonus Strange Yemen fact, English comedian Eddie Izzard was born there. A quick Google later and that vast caché of knowledge had expanded to include: where it is (at the bottom of the Arabian peninsula underneath Saudi Arabia); some economic facts (very little oil, poorest state in the Gulf region); and a little bit of history. Yemen was the land of the Biblical Queen of Sheba (one of the rulers of the ancient Sabaean Kingdom) and was known to the Romans as Arabia Felix, or 'Happy Arabia', because of the riches generated by the spice and incense trade. The Republic of Yemen is slightly smaller than France, has a rapidly expanding population of around 21 million, and many of them are daily users of a narcotic plant called Qat (more of which later). Yet even knowing all of this this could not have prepared ne for the culture shock of landing in the ancient capital Sana'a at 7am on a Saturday after a 12-hour flight via Cairo, or the hypnotic calls to prayer of the muezzins bouncing off the mudbrick high-rises. An old Yemani Royal Palace - Made Out of Marzipan. It's one of the weird side-effects of 21st-century travelling. You leave your familiar surroundings in Dublin one grey morning and within half a day, you are standing, bewildered, in the middle of a crowd scene from Arabian Nights as women in full-length black sharshafs shove past you, with only their dark eyes showing through narrow slots in their veils. Sana'a itself, once you start to get your head around it, is a lofty 2,000m above sea level and appears, at first glance, to be the capital of one of the dustier planets from Star Wars (especially when the moon looms hugely out of the high desert sky). Five or six-storey mud brick buildings, with roofs and floor levels picked out in black, white or red stone and whitewash framed arabesque stained-glass windows, crowd inside ancient walls. Like much of the rest of the country, it's dusty and crowded, weird and wonderful, and incredibly beautiful all at the same time. 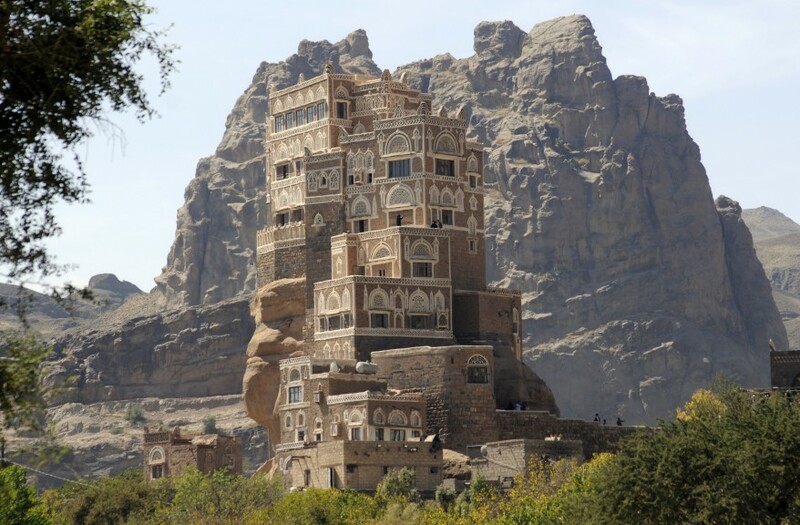 The Yemeni tourism ministry had arranged for a driver and a guide to meet myself and my two travelling companions, a young Englishman and a fiftysomething Englishwoman with a lot of experience of the Middle East. "Hello, where are you from?" (the standard question from all Yemenis and one that we would hear at least 20 times a day over the coming week, there not being a lot of foreigners around). When we informed our guide, a local man who had lived in Canada, that we were "one Irlanda and two English", he made an executive decision. "It's better if you say you are all from Ireland -- too many questions about Bush and Blair," he said. Score one for the former colonies (Irish and Yemeni) and a week of stiff upper lip declarations of Gaeldom from my English travelling companions. Of course, the fact that Yemen has long been on the British Foreign Office list of countries you should not travel to -- under the reassuring headings of 'Terrorism', 'Kidnapping' and 'Hostages' -- may have also informed our guide's advice. At the time we visited, there had been several incidences of tourist kidnappings. And botched rescue attempts by the Yemeni army. There was a long list of incidents such as the one in July, 2007, when eight Spanish and two Yemeni nationals were killed and a number of others injured in a suicide bomb attack in Ma'rib, 100km east of Sana'a. We could only travel outside Sana'a, with an official guide and, every 100km or so, there are army checkpoints that record your passing through and inform the next checkpoint down the line when to expect you. "If we don't show up in a couple of hours, then they will come looking for us," explained the guide, with the nonchalance of a man who was never going to be suspected of being a close personal friend of George W Bush.. Within hours of landing in Sana'a, we were going through our first checkpoint as we began our long climb up into the Haraz mountains. And after the exotic otherness of the ancient capital, this was where the great secret of Yemen was revealed. While the east of Yemen is classic Arabian desert, the western half is spectacularly, jaw-droppingly beautiful mountain country. We climbed from a high desert plateau into endless jagged mountain ranges, with every mountain top and foreboding rock crowned with a heavily fortified village that appeared to be made out of blocks of marzipan. Every mountainside is terraced in the style that would be familiar to people who have travelled through the former Inca empire in Peru. At the top of each mound rising above us were yet more impossibly beautiful castles in the air under milky-blue, Alpine skies. Our four days in the mountains went roughly like this: get up at 6am for breakfast, climb into the Land Cruiser, drive vertically for six hours (stopping off for lunch in fly-blown mountain villages), walk for two hours from one village to another over knife-edge ridges, then find a ramshackle guest house for an evening meal and bed. The hotels/guest houses were mostly primitive, but usually clean and very welcoming. There were some hitches. At the mountain village of Manakha, the four brothers who owned the local hotel we stayed in played music and performed a traditional dance while we sat cross-legged on the floor eating rice, flatbread and spicy goat meat (which I love). There was a collection of dusty old rifles in the corner. I picked one up (an ancient British Lee Enfield), thinking it was an ornament. When I pulled back the bolt, I saw the live round in the chamber. My shock produced a few laughs from our hosts. Now, no man in Yemen is ever seen without his traditional J-shaped Jambiyya dagger in his belt, in the way that our granddads would have never gone outside the door without their caps. And the traditional dance performed for us that night was, as far as I could make out, the famed 'Brandishing the Fearsome Daggers Under the Noses of the Terrified Tourists Dance'. But in a country where you regularly see guys wandering around the markets with AK47s, it wasn't that scary -- at least not until they picked up their rifles for the big finale. Thankfully, nobody was seriously injured and when midnight came, we retired to our bedrooms on the third floor. And that was when the fun began. As well as the knives and guns, most males in Yemen spend virtually every afternoon chewing Qat, a mountain bush that apparently has mild cocaine-like affects. It's chewed like tobacco, which makes the men, chawing on huge wads of green leaves in their cheek pouches, look like heavily armed hamsters. I actually tried some with the Homicidal Manaka Brothers, sat in the room with about 14 guys chewing away for a while. And all it did was keep me awake for 48 hours. Which would prove to be a bit of a problem. Late that night, as we settled down to sleep, our armed and by now drug-addled hosts decided to put a fourth floor on the hotel, using a cement mixer, pneumatic drills and hammers. At about 4am, my fourth attempt to get them to stop saw me come as close as I ever want to be to starting a knife-fight with a tooled-up, drug-crazed dance troupe. I was standing there in my shorts, screaming threats at any man who picked up a drill. Remarkably fool-hardy given they had a stack of AKs next to the shovels. All very colourful (and true, I swear), but not representative of a country where I always felt safe and the people were gentle, friendly and delighted to meet foreigners. But there is a reason that people still live on the highest rock of the highest mountain. And men often carry around automatic rifles. A reason that we have been reminded of in the past couple of weeks, with the Saudis and Iranians (and all the rest of the neighbours) joining in the civil war to fight a proxy, sectarian war. The utter bastards. So now Yemen is about bombs and terrorism. But when I see the headlines, I remember how, when I went into the highlands, a pocketful of cheap pens (the man from the tourist ministry told us to buy some in the capital) would win lots of smiles and Kodak moments from the kids who popped up from behind every boulder and wall. Unfortunately for those kids, Yemen was in no way ready for mass tourism in the way that, say, Dubai had established itself. Despite having all of the scenery, history and culture that Dubai lacks. Yemen is now a country in agony. And it makes me sad. Because it is just so unbelievably beautiful and interesting. It should be a world class travel destination. It is a dream location for mountain trekking, wild, spectacular, friendly and almost totally deserted. And in a world of increasingly jaded travellers, Yemen could be that rare beast, an unspoilt, unexplored desert and mountain paradise, travel Nirvana for the truly adventurous. Or course, this is an outsider speaking. What really matters to the people there now is peace and stability. I hope they get it. Really enjoyed this also. Unexpectedly and very naively ended up there for 6 months many years ago. The most incredible, humbling, exciting and indescribable to those who haven't been there time of my life. Heartbroken now every time I see it on the news. Your story took me back and I really enjoyed the memories. Thanks very much.